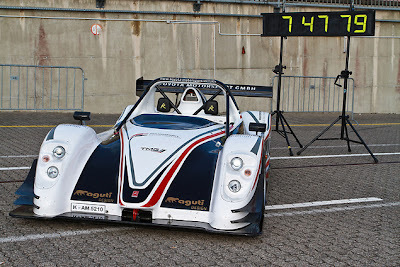 TMG's target prior to the 29 August record run was to become the first electric vehicle break the eight-minute barrier and this was achieved comfortably on a day when the notoriously changeable Nürburgring weather stayed fine, although track temperatures were relatively low. Such performance shows TMG's electric powertrain is ideal to power any future single-make electric motorsport series and TMG will begin commercial sales of this technology in 2012. TMG continues to advance its electric vehicle capability for motorsport applications with in-house development of the electric powertrain and ongoing investigations into alternative chassis solutions. Pascal Vasselon, TMG's Technical Director, said: "The goals for this project were twofold: obviously we wanted to set a new EV lap record and I am very pleased we could achieve that so comprehensively. On the other hand, we also wanted to learn more about the operation of our electric powertrain in extreme circumstances; in motorsport there is no more extreme circuit than the Nürburgring. On the record lap the TMG EV P001 performed better than in testing due to the improvement we already could make based on that experience. We have enhanced our electric powertrain development thanks to the information our engineers have gained and our future EV products will benefit from this project." Rob Leupen, TMG's Director Business Operations, said: "This is a very impressive achievement which really shows the huge potential for electric powertrains to deliver fast, exciting action on the race track. There's no doubt that electric motorsport can be every bit as thrilling as traditional racing and it was an amazing sensation to watch the TMG electric vehicle fly past on the Nordschleife, with only the sound of wind rushing past and tyres squealing. To achieve a new lap record at the first attempt, and by such a huge margin, is a great achievement and I am very proud to see TMG's name in the record books. But this is not the end of the story for TMG and I hope we will see our electric powertrains in action on the track again soon."